Blade Runner 2049 has been playing on my mind. Roger Deakins (the cinematographer) has somehow invaded my soul using his unique style of lighting and camera work. I came away wanting to look at those scenes again. I wanted pieces of those scenes. I'm pretty sure I'm not the only one. I'm proposing to recreate several scenes in scale by placing them inside a cube which has a glass ceiling (transparent from above but not from the inside). 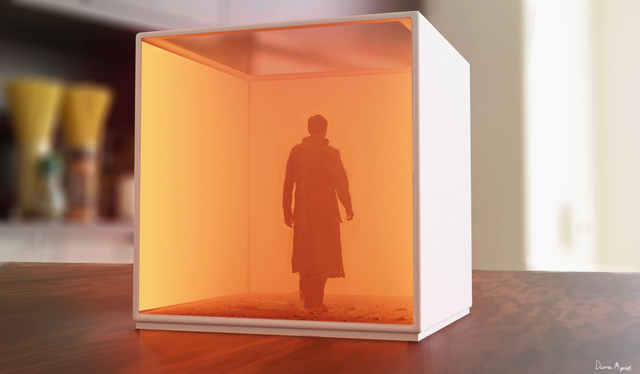 The cube enclosure will allow me to recreate the lighting effects to represent the scene. Using scale models produced to the highest quality and by using accurate lighting, I want to create something that replicates those dystopian scenes to the closest degree possible. I have experience in manufacturing, I have two great companies that I have used before who can produce what I'm proposing. I've already had two concept drawings produced which give a preview of what they could look like and I will be producing more variations on the cube colour and internal scenes. I'm hoping to produce fully functional prototypes that do the film justice. This means making sure the design is flawless. Pieces of art that can be replicated in larger numbers at a reasonable cost. I'm hoping that you can support me through what is going to be an exciting design process. Of course I will be documenting the whole thing through video and blogs exclusive to Patreon. I actually really need you guys to help me on this. I want it to be highly accurate, I want to regurgitate those feelings that I know you had when you were watching this film. I want you to be able to walk into a room and become transfixed by the visual pleasure that awaits you. At the end of the process, my Patreons will of course receive a discount on the final purchase price of a complete unit. The discount and purchase price will be clarified once a prototype has been completed. You will have access to Patron only content which will document product development from start to finish. You'll get a behind the scenes look at the design progress and problem solving. Upon the product being ready for manufacture you will receive a discount voucher as a thank you.